An explosion has rocked the centre of Mexico City, killing at least one man and injuring two other people. 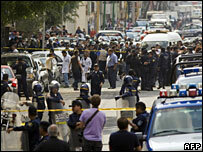 The device was set off near the city's police headquarters, Mexico City police chief Joel Ortega said. No group has so far said it carried out the attack. Investigators believe the bomb was activated remotely by a mobile phone. The dead man's hand was blown off, the police chief said. It is unclear whether he was responsible for the bomb or if he simply picked up the package. The blast occurred at about 1430 (2030 GMT) near the tourist area known as the Zona Rosa (Pink Zone). The scene was cordoned off by hundreds of police officers in riot gear as police helicopters hovered overhead. Mexico's government has been locked in a violent battle with drug gangs since last month. Police have announced the arrest of several alleged members of the powerful Sinaloa drug cartel and seized substantial amounts of weapons.